Pigs in a Blanket is an easy recipe and requires only two ingredients (three if you want cheese!). 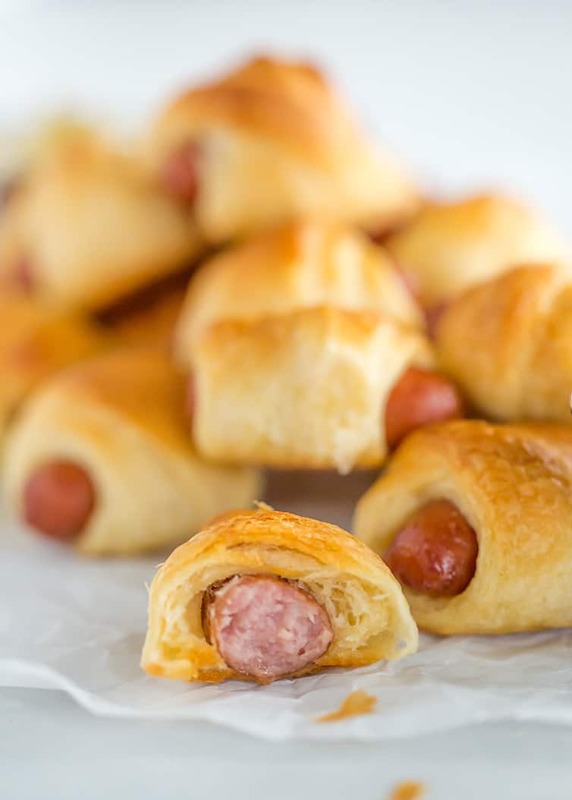 Simply wrap mini hot dogs in crescent rolls and bake… Perfect for kids, parties and the Super Bowl! 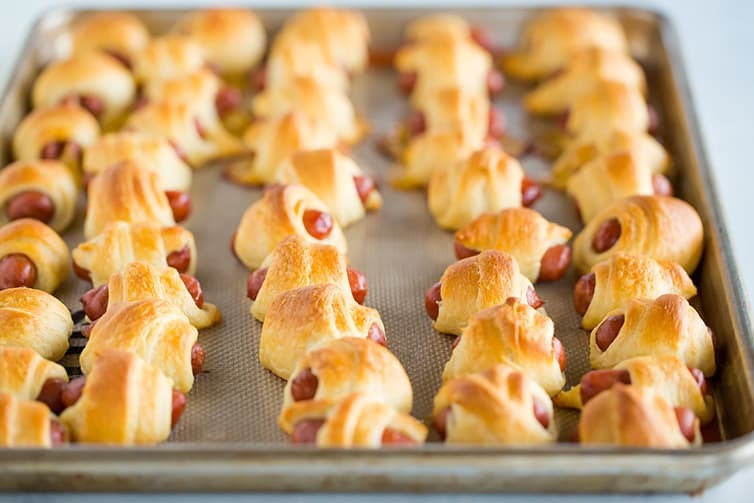 Pigs in a blanket… what a name, right?! 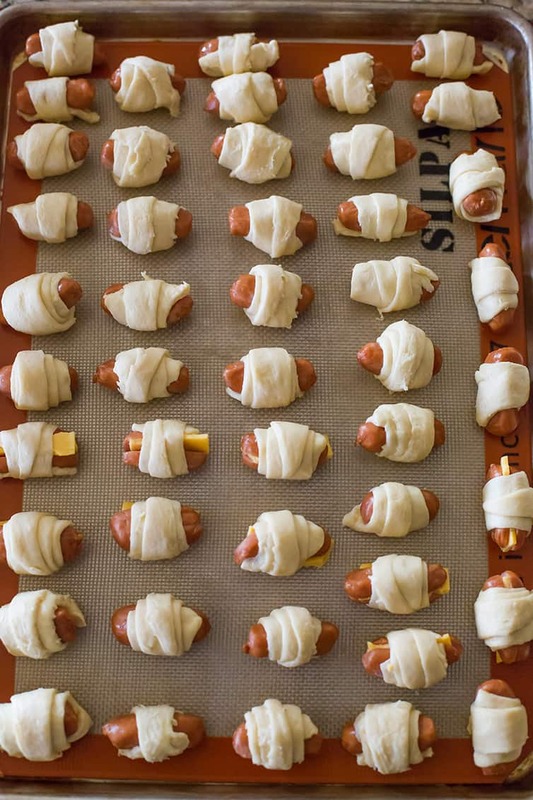 If you can believe it, only around five or ten years ago did I realize that most of the world knew these mini hot dogs wrapped in crescent roll dough as “pigs in a blanket”. 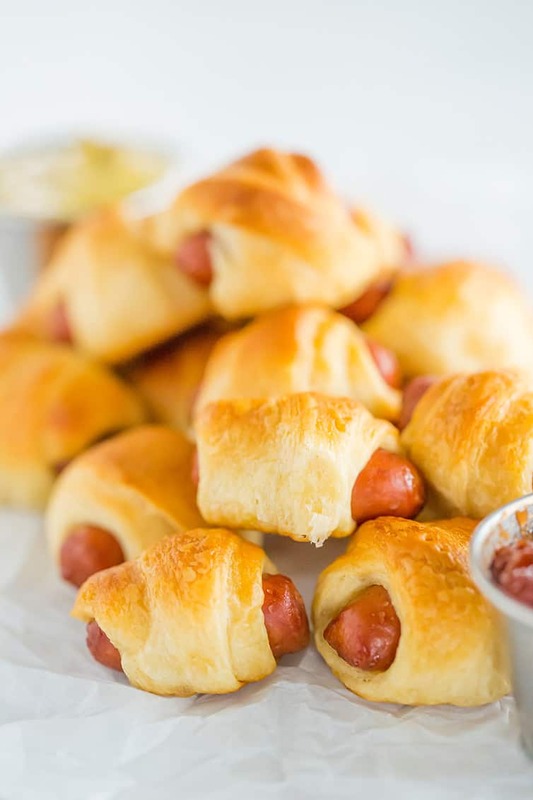 Growing up, my mom often made the full-size hot dog version of these as a special treat, but she called them “crescent dogs” or “crescent roll hot dogs”, and that’s the only name I ever knew them by. In fact, my grandma would make stuffed cabbage rolls on a fairly regular basis and she called THOSE pigs in a blanket, so I was utterly confused when I saw a recipe for “pigs in a blanket” that were my beloved crescent dogs, ha! I’ve also seen pigs in a blanket refer to a link of sausage wrapped up in a pancake, so there’s that, too. Whew! BUT! Enough about the name, let’s talk about these retro, iconic, and utterly addicting hot dogs, because they are SO. GOOD. You unroll the crescent roll dough, separate the triangles, slice them into strips, then roll up the little mini hot dogs. So quick and simple! 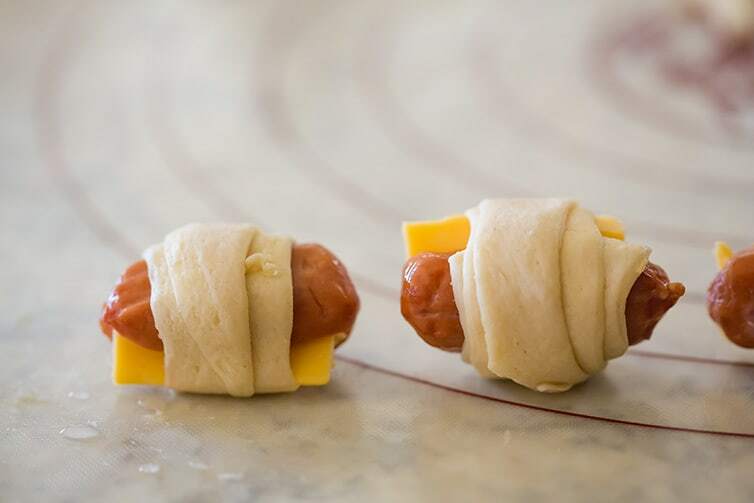 If you want to do full-size hot dogs, simply skip the step of slicing the crescent rolls into three, and roll one dog in each full triangle of crescent roll dough. If you want to go the cheese route (and seriously, I ALWAYS wanted cheese in mine when my mom made these! 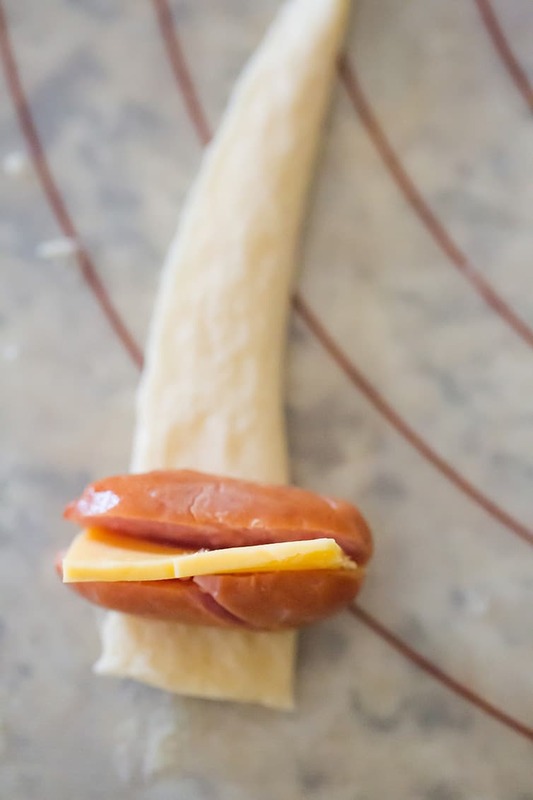 ), simply use a paring knife to cut a slit in the hot dog and stuff a little piece of cheese in there, then roll up like the others. 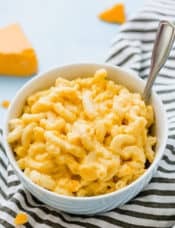 I use American cheese because that’s what my mom used when I was a kid, and it’s my husband’s and my kids’ favorite, it melts wonderfully, and it’s just plain good. However, feel free to use cheddar, pepper jack, whatever you’d like! Seriously cheeeeeeesy pigs in a blanket. LOVE. If you want to go full-on homemade pigs in a blanket, you could always experiment with homemade biscuit dough, homemade puff pastry or crescent rolls (I have a homemade crescent roll recipe, if you’re interested!). 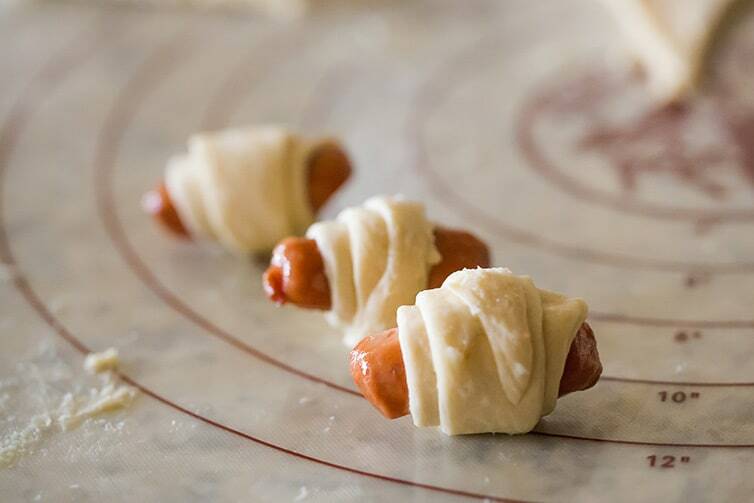 You could even make crescent roll hot dog mummies for Halloween! 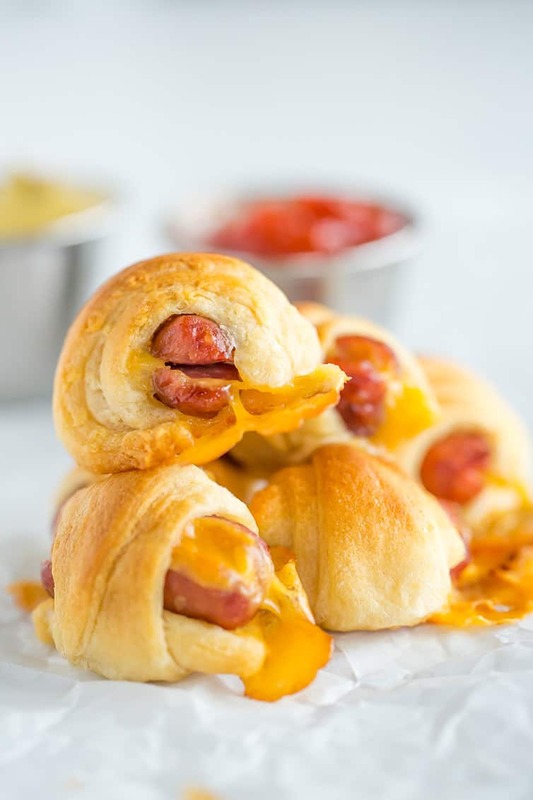 Whether you’re looking for an easy appetizer or snack for a kids’ party, for the Super Bowl, game night or your run-of-the-mill Saturday night, these pigs in a blanket (or maybe they’re piglets in a blanket since they’re mini?!) will ALWAYS be a sure-fire hit. Every time I’ve made these recently, everyone goes crazy for them and is constantly exclaiming, “I can’t remember the last time I had these!” If there’s one thing I’ve learned, people love food that brings back all sorts of warm and cozy memories, and these crescent-wrapped hot dogs do just that for me. 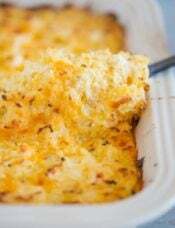 Want More Crescent Roll Recipes? 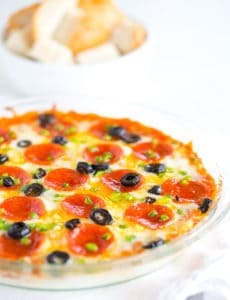 An easy recipe that requires only two ingredients (three if you want cheese!). 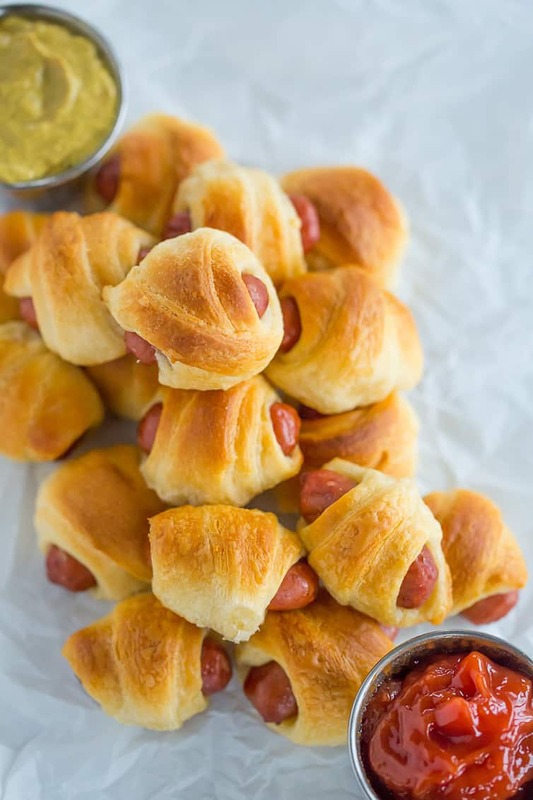 Simply wrap mini hot dogs in crescent rolls and bake! package mini hot dogs, cocktail franks or "Lil Smokies"
Preheat oven to 400 degrees F. Line a baking sheet with parchment paper or a silicone baking sheet. If you want to make full-size hot dogs, simply use regular hot dogs and a full crescent roll triangle for each hot dog (do not slice into three strips). Bake as directed above. These pigs in a blanket loops perfect and yummy. I can almost taste them. Gotta try them, especially, with tge cheese added. Years ago I tried spreading honey mustard on the crescent rolls before rolling up the little piggies. It’s now how I always make them – it adds nice flavor. Oh I love that idea! I bet it’s delicious! 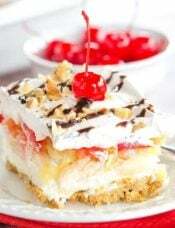 I absolutely adore retro recipes! I’ve never made the salami roll-ups, but I’ve seen them and can’t wait to try them myself. Also, the ham, cream cheese and pickles sounds delicious! I LOVE dill dip, but never put it in pumpernickel bread, that is genius! Totally doing that next time! You use the cubed bread from the pumpernickel bread that your scoop out to dip & then eating the bread bowl is the best part! Deja vu, man! Ahhh so sorry for the confusion, but I totally understand! I’m not sure if you read the whole intro, but my entire life until 10 years ago I thought “pigs in a blanket” were stuffed cabbage rolls, too! That’s what my grandma always called them :) My mom always called these “crescent dogs”. I hope you’re not too disappointed; I’ll have to get to that “other” pigs in a blanket recipe sometime soon, too! I tried your recipe for crispy chicken wings. Very disappointed. 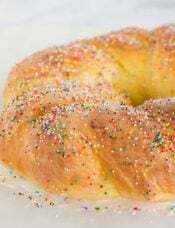 The skin was like rubber and I followed your recipe to a t.
Hi Judith, I’m so sorry to hear that :( I’ve made them tons of times and have had very consistent results, and a number of people have left reviews that they’ve turned out really well for them. Do you happen to have an oven thermometer to ensure that your temperature is correct? And did you use fresh wings, not frozen? These are so cute and yummy looking! I haven’g made pigs in a blanket for years! I think my 9 year old grandson will love these…esp. since there’s cheese in them! 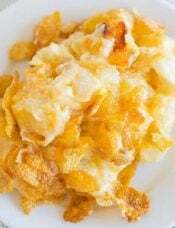 Well, of course, as an ancient Brit, I remember these as always served on Bonfire Night (Guy Fawkes, November 5th). Only they have always been called Sausage Rolls there. My mother always made them with tender shortcrust pastry and sausage filling – links of British bangers removed from their sacks and worked into a long roll then placed on one side of thin pastry rectangle and rolled up. Now I often use puff pastry and ground sausage, but they can be whatever you like. Anyway, they are a great outdoor food. I definitely want to try the ground sausage and puff pastry version, it sounds so good! We always called these crescent dogs! I thought I was going to find a sausage wrapped in pancake recipe when I opened my email …. ha ha! My (picky) kids and husband love these. I sometimes make these for dinner on busy days. Next time I will have to try adding American cheese …. I think my kids would love it. We love pigs in a blanket in the south! LOL I recently made a batch and before baking them I rolled the tops in Everything Bagel seasoning – they were a huge hit!! Ooooh the everything bagel topping sounds amazing! Totally trying that next time! Instead of the crescent rolls I like to use the bread sticks that come in a tube. 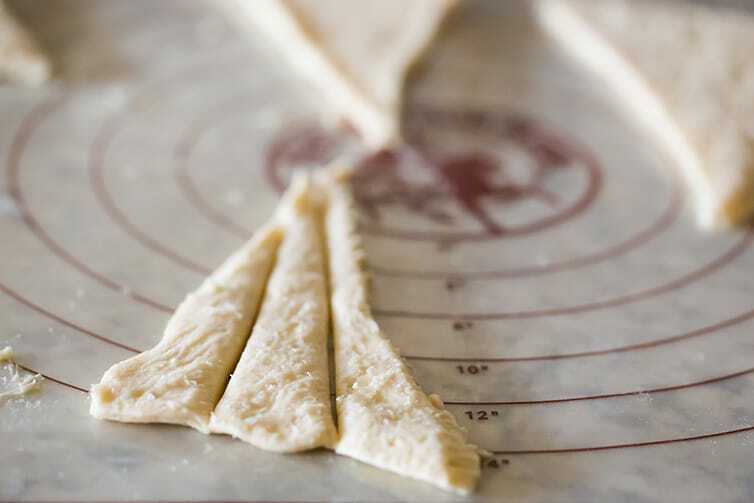 Cut the dough into small strips and wrap. 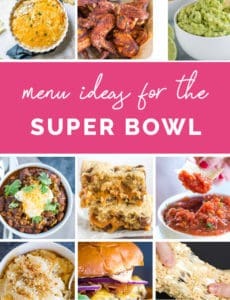 Made any way these are fun and delish! Love that idea, too, thanks for sharing Terri! Dear MICHELLE, I found a nice recipe article on ” PIGS IN A BLANKET” on your website. 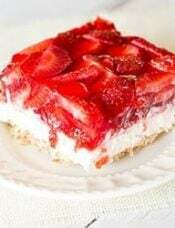 Surely I will love to try this recipe but I wish you could add a recipe video. 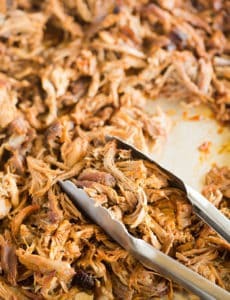 by the way can you assist me about the food calories measurement of this recipe? Hi Wali, Thanks for the feedback! I’m slowly adding a lot of recipe videos, but don’t have one for this particular recipe yet. I don’t have any nutritional or calorie information, but you could calculate it on your own using a site like MyFitnessPal.